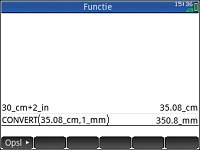 The HP Prime contains a variety of units. So that variables can be created and implemented loading and conversions. 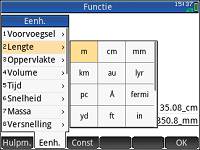 In addition, 34 scientific constants are available that can be directly incorporated into the calculations. Different units for length, area, volume, time, speed, mass, acceleration, force, energy, power, pressure, temperature, electricity, light, angle, viscosity or radiation can be selected. Once the metrics have been provided with the appropriate units, they can be expected with these sizes. Similarly, conversion of sizes is possible. As a complement of mathematical and scientific reference works the HP Prime has constants in the fields of mathematics, chemistry and physics. 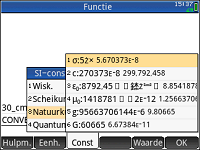 These constants can be directly involved in the calculations.